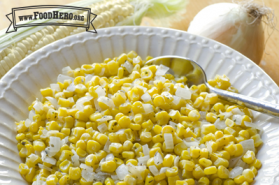 1 cup corn (canned and drained, frozen, or fresh cooked). Add chopped bell pepper for more color. Heat margarine in medium skillet over medium-high heat (350 degrees in an electric skillet). Add corn, onion, oregano, basil, salt and pepper. Stir to coat evenly. Cook uncovered until onion is tender and corn is heated through, about 5 to 10 minutes.